The world has always been full of trials, disappointments, temptations, fractured friendships, and financial hardships. Yet Paul's letter to the Philippians claims we can discover contentment and joy in the midst of it all by prioritizing what matters most-Christ. Unearth the secret of contentment-knowing Christ. 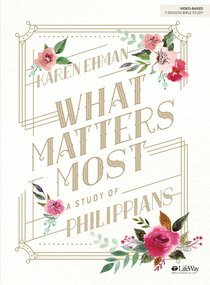 About "What Matters Most: A Study of Philippians (7 Sessions) (Bible Study Book)"